No, we’re not asking you to clean out your closet for this one! However, it may require you to do a little searching through your Ravelry notebook, project journal, or knitting blog and dig up some of those Finished Objects you’ve cranked out over the past year or two. We’re searching for some new candidates to add to our Finished Projects page, and are looking to YOU to help bulk up the gallery. 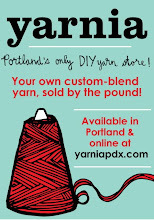 Find a project that you’ve completed using yarn from Yarnia, and tell us about it! Fill out the form on our contest page, providing as much information about the yarn as you can. Finally, upload a photo of your project. All entries will be judged at the end of April, and the winner will receive credit on our website, a link to his/her blog or website beneath the photo (if desired), and 1 cone of ANY house blend of yarn he or she chooses, on the house!